Panama City is not a popular travel destination, but to me it sounded exotic and seemed like a good place to study Spanish for a month. 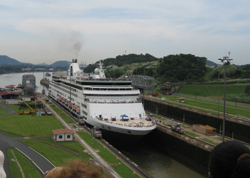 I had read a ton of great things about Panama on the Internet that made it seem like a fantastic up-and-coming city. Plus I saw the movie the Tailor of Panama with Pierce Brosnan and was intrigued. I really wanted to see the place. Unfortunately, after spending a month in the city, I came to realize that the great things said about Panama City on the Internet are just hype spread by the people who develop and sell high-rise condos in Panama. There are only a few Spanish schools in Panama City, and these schools have few students. Panama City is not a popular destination for Spanish studies. My Internet research led me to ISC Panama in the Bank of Boston building in Panama City. I sent them an email to find out how many students they had. The school told me they had 30 students and a group for my level would be no problem. Fantastic! It was important for me to study with other foreigners so I would have people to hang out with for a month. When I arrived at ISC Panama at 9am sharp for my first class, I was surprised to find that nobody was there. I knocked on the door, nobody answered. I waited around for a half-hour, but nobody showed up. Eventually I called their number and was told that my class would be at 11am so I should come back later. When I returned to the school I discovered that this school actually had very few students and there were no group classes, only private classes. In fact, during the entire month I was there I only saw perhaps 2 or 3 other students. The school explained that most of their students work in embassies or corporations and they give their Spanish classes on-site. At this point, I looked around for other Spanish schools in Panama City, but found no viable option. I also looked for private tutors, but didn’t find any. I was stuck with ISC for the month. In truth, the teachers were good at ISC Panama and my private classes were enjoyable and productive. The cost was about $10 per hour. However, if I had known that I would be studying alone I would not have come to Panama. I would have chosen a different destination. In Panama I stayed at an apart-hotel called Tower House Suites. I paid about $750 for the month, which included a barely edible breakfast. 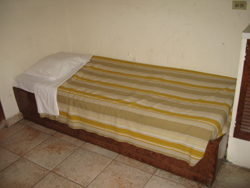 The accomodations weren’t too bad, although I did battle a giant cockroach one night, and the second bed looked like something you would see in a Mexican jail (see picture). The staff were not particularly friendly. Then again, I didn’t find Panamanians to be very friendly in general. This hotel was located only maybe 8 blocks from the school in the commercial center of Panama City. Still, it was a tough and unpleasant walk due to lack of sidewalks, extreme humidity during the rainy season and relentless traffic with no safe way to cross the streets. This is a dangerous city. I don’t recommend walking around alone at night. Even daytime can be dangerous. One afternoon a drug addict tried to rob me while I was walking the few blocks from the school to my hotel. He showed no weapon and, after a small struggle, I managed to keep my wallet since I was bigger than him. I think the outcome would have been different if this had been night time. I think he would have used a knife. This particular incident occurred in full view of passing motorists and even building security guards. I don’t think any one of them would have lifted a finger to help me if things had gone bad. Panama City is not a good place for walking around. The sidewalks are either in bad repair or non-existent. You take your life in your hands every time you cross the street. Nobody wants to stop for you and there are very few traffic lights or crosswalks. There is very little to do in Panama City, unless you like to go to casinos. Walking to or from the casinos you will probably be hassled by Colombian pimps. And of course you run the risk of getting robbed. Shopping in Panama City is not good. There are a few American-style malls. I visited one mall where the doors were guarded by men with shotguns.